Nothing wrong with a little "fake it 'til ya make it!"... 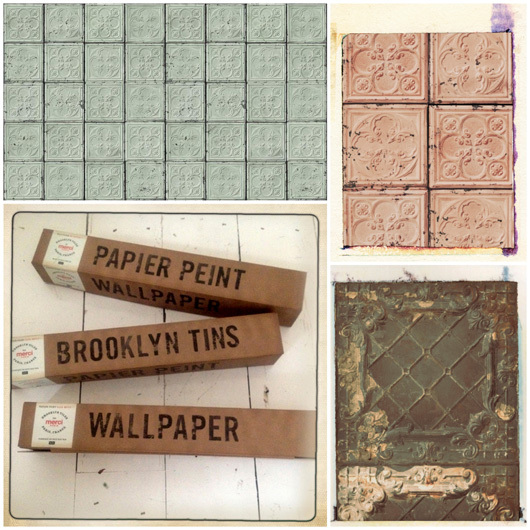 I wrote about 10 ideas for realistic wallpapers last June but now I have another great wallpaper called Brooklyn Tins to share since Piet Hein Eek and NLXL have teamed up with Parisian design store Merci (store tour here), to create a gorgeous line of faux wallpapers (or fauxpaper as I like to call them) that are now available to purchase. These photo-realistic papers are based on Victorian press-tin ceilings that were so popular in Victorian New York and are digitally printed onto non-woven paper and look astoundingly realistic. You can find them over at the Wallpaper Collective in the US and Rockett St George in the UK. I was especially intrigued to learn more about pressed tin and so after a little digging, I learned that it was first introduced to North America as a lower priced option to the plasterwork used in Europe and became quite the 'trend' to have pressed tin ceilings during the Victorian era since Americans craved more extravagant, detail-rich interiors. In fact, when you go into a NYC apartment (or property anywhere in the states) and see original pressed tin ceilings, it's only natural that you'd go a little weak in the knees as it's highly sought after among those who love vintage, original decorative details. If you'd like to deepen your design education concerning tin ceilings, try reading this. I first started thinking about vintage tins as being a bit more special than usual when I was in Soho this past March working with photographer Debi Treloar because she had said that she loved the tin ceilings in the apartment where we were working and that it was very, "American". I hadn't thought of tin ceilings as being very American until now - I had assumed they were once all the rage in Europe too - but apparently not. 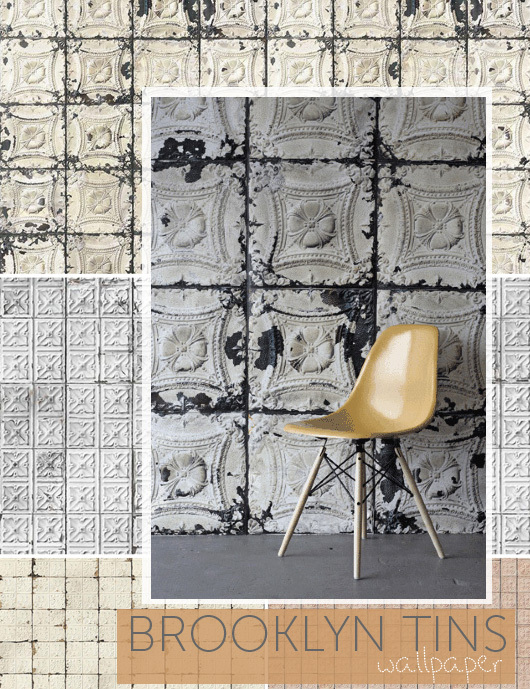 These wallpapers are so creative and fun - would love to see them applied to ceilings but also to walls - just lovely! What do you think? Would you decorate with them? Where do you think they'd work?